In a recent post I wrote you about our trip to Shanghai. The second part of our trip to Asia brought us to Tokyo, which was a completely different experience. While I was there, I saw that Japanese green tea, or matcha, was used very often as a key dessert and pastry ingredient. There are even matcha Kit-Kats and matcha candies. After being in Tokyo, I have decided to make my own matcha dessert. 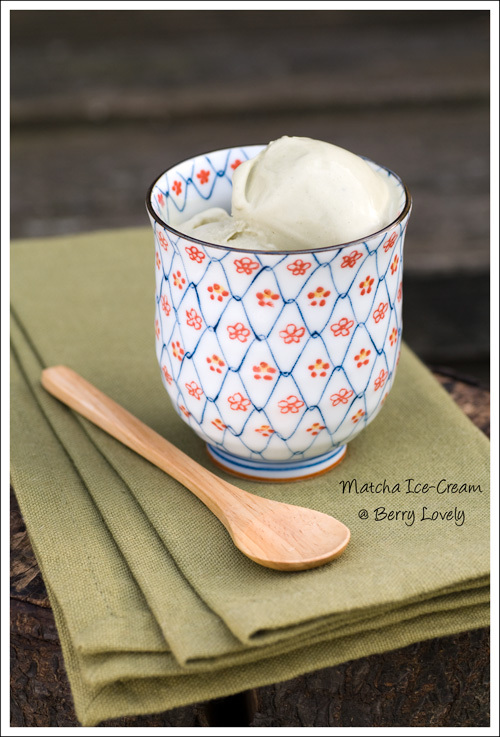 Why not start with the most popular of all; the matcha ice cream. But before we go on with the receipe, I would like to tell you about my experience in Japan. As with China, it was also my very first time in Japan. Tokyo is incomparable to everything I have seen before. It is very busy, but at the same time calm and orderly. The people are very polite, and the taxi drivers are even all dressed up in suits, ties, and gloves. When you are in a big department store, you will see the the staff bowing at you, sometimes even in formation. If you are used to the chaos in China, it might take you some time to readjust to the almost sterile atmosphere that is in Tokyo. It is also very hard to find your away around, whether you are Japanese or not. There are no street numbers in Japan, only neighborhoods and blocks. Then add to it the fact that some places are just so huge, you really don't know where you are until it's too late. The biggest train/metro station in Tokyo, the Shinjuku Station, has more than 60 exits, in a huge underground labyrinth. If you end up going to the wrong exit, you won't be able to trace your way back. Sometimes, that's part of the joy in traveling, isn't it. The food in Japan is well known for its total perfection. Everything is beautifully executed and arranged, and has flavors that are unique to the dish. The sushi is, of course, fantastic, whether you are in cheap kaiten sushi joints, or in more upscale establishments in the Tsukiji area. However, there are also food items I find strange, like the chicken sashimi, which I would not incline to try. Of course I had to pay a visit to the famous pâtissier Hidemi Sugino. I have heard stories from other bloggers, who had to endure long line ups, only to find out their favorite pastries had been sold out. Luckily, it was around the corner from my hotel in Ginza. We went around midday, there was still a broad selection to choose from, and the service was very prompt. I have to say, it was the best pastry I have ever experienced. Everything down to the texture and temperature tasted just right. 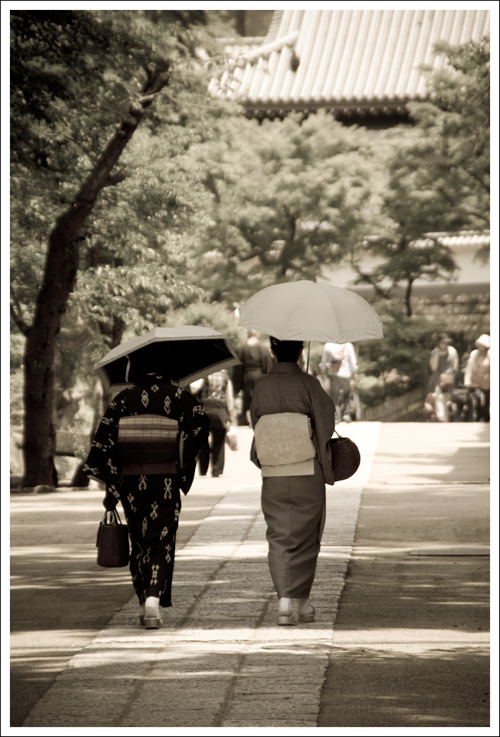 Despite being a progressive hi-tech society, the Japanese are also very traditionally minded. They have some of the most immaculate train and communication systems in the world, and yet you see a lot of Japanese, still observing their traditions. It is not uncommon in the metropolis like Tokyo to see women shopping in their elegant kimonos, or people going to temples, keeping in touch with their spirituality. These two seemingly polar opposites exist in harmony, and gave the Japanese people their unique cultural identity. Unfortunately, I have not had the chance to see the famous Geisha or Geiko while I was there. In a saucepan over medium heat warm the milk together with the sugar and salt. In a bowl whisk together the cream and matcha powder. In another bowl whisk together the egg yolks and slowly pour the hot milk into it while still whisking. Pour back into the pot over medium heat and stir with a heatproof spatula until thickened. Pour the custard into the cream, if it has curdled through a sieve. Whisk together until it's frothy and the matcha powder is dissolved. Put the mixture into the fridge until thoroughly cooled. Freeze in your ice-cream machine as directed by the manufacturer.